Managing depression can be a difficult thing, especially when you are uncertain as to the cause of it. Using a simple calendar or a diary, is one of the ways of chronicling when your episodes happen and what your episodes were about. One can simply step back and look at a month or week in question and possibly see a pattern arising. Another use of the diary, is that one could try to build a narrative, and through that narrative make a break-through. As one begins to see a story form, one can begin to understand the possible context that the depression came from. This is the easiest way, of putting it all together in one piece. And in the future, one can also relate it to others so that they may easily understand you, sympathize, and help you out. The DSM-V, divides depression into different categories, categorized by severity, frequency, and mixed presentation. Major, Manic, Mixed, Hypomanic, Major recurring, Disthymic, Cyclothymic, Bipolar 1, and Bipolar 2. Each one has a varying degree of severity with mixed presentations, or whether they stem from an event, or from a conditioned state. Each one is medicated differently according to its presentation. Likewise in Chinese Medicine, the depression is looked at according to its presentation and symptomatology. The emotional state that one is in, while in the depression, or out of it, gives a the practitioner a sense of what is the base emotion that the patient is overwhelmed in. There are five different “spirits” or psychical states that one may find themselves in according to Chinese Medicine. These are the emotions commonly expressed as Anger, Joy, Worry, Grief, and Fear. One may have a predominant “spirit” which their personality may dictate. Usually these emotions are in a harmonious relationship and when one emotion overtakes the other, the self and the body becomes overtaxed. Excessive anger may rage and burn one out, over elation repletes instantly, excessive worry hampers action, and denies expression. Also animproper response or inaction to one of these emotions may stultify or depress another. When one does not act within the moment of the occurrence of anger, depression may arise, or when one conceals their joy, depression may arise also. When one doesn’t heed caution to worry, depression may arise, and so forth. These imbalances take a toll on the body, and produce lethargy, anxiety, over-compulsion, lack of self esteem, and so forth. Acupuncture is a way in which the body can heal itself and the mind also. Acupuncture opens up the flow of the body’s channels to experience movement again, it rejuvenates, and releases tension. It clears the mind, and shows the mind where the body is tensed, and where trauma may have hidden itself. There have been situations where one has cried after a treatment, or was so relaxed and relieved that they “felt like their old selves again.” This is where one can remember themselves, and who they have been and pick up the pieces and start all over again. Courage and strength with support can then lead the way to a new beginning. There is a big hub bub out there about what constitutes acupuncture, and who can practice acupuncture, and under what credentials. Apparently, there are continuing education classes for Chiropractors, Physical therapists, and Medical Doctors, that are usually weekend courses, just shy of 15 hours. The biggest proponent of dry needling is Dr. Yun Tao Ma, who has done extensive work in the University level, and for the NIH. The big stir is that this allows Physical Therapists take a weekend course and perform “dry needling” which some argue is a form of acupuncture on patients for pain relief. Most physical therapy can be covered by insurance, and is readily accepted by the medical profession. A majority of Orthopedics and the like, are quick to give out prescriptions for physical therapy, for pain management and recovery. However, it is rare that one would think of giving out a prescription for acupuncture. Many people fear, that the training that is involved with the Continuing Education, is insufficient to what is a part of an acupuncturist’s training, and that the type of “needling” that is done is no where near to what an acupuncturist can accomplish. Dr. Ma, bases his type of needling on neuro-pathways and not at all on acupoints or meridians. So are they the same or are they different? Many Acupuncturist are upset that Physical Therapist can claim they do acupuncture, or bill under acupuncture, when they have no certification for it or even formal training as an acupuncturist does. There actually is an ordinance in Rhode Island, that states, that a person, who doesn’t have any licensing in acupuncture, cannot advertise services in acupuncture, for example in the case here, a Chiropractor or a Physical Therapist providing “acupuncture” services, when what they are really doing “dry needling”. Since not all states have regulations over acupuncture, most people are unaware of what acupuncture really is or what it is capable of. The majority of patient education lies in the practioner informing the client of what each session entails, and what it is he is actually doing, and what to expect out of each session. The general public is easily schemed as we have seen, various shams appearing in the media about fake “plastic” surgery, or bo-tox injections. If someone can convince someone into purchasing a “bo-tox” injection, without any credentials, then why not acupuncture after a two day seminar. Are we to get angry and protest the actual courses where the training occurs? No, not really. We can get angry, and approach our professional regulations bureau, as well as our affiliations to put higher guidelines, and fight for something like what they have in Rhode Island. But to actually protest a training session coordinated by someone who has strong credentials and has “sold out” to another medical profession, I am not ready to get my liver qi all hyperactive. I have talked to Chiropractors who have had CEU courses in acupuncture or “dry needling”, and the majority say, they really have no need for it in their practice. Either they tried it on their patients as a novelty at first to obtain a result, either didn’t obtain the result they wanted, and returned to their previous methods in treating that particular pain. Some others, who have used it, and have gotten a result, use it to refer out to another acupuncturist. They usually stick to what they know works for them, and acupuncture just becomes a tool in their bag to use every once in a long while. The argument that some of the protesters have, is that they are worried that their lack of training may injure their patients. This is silly. Why are we to worry about someone else’s patient? Its their lack of training, and lack of skill, that may get them in a lawsuit, or increase their malpractice premium, and even most likely lose their client. Like, I said most Chiro’s that I’ve met that have had training usually say they’d rather let the acupuncturist do the difficult needling. There are also many tools out there that we as acupuncturists do that may be considered out of our scope, that we also borrow from other professions, such as muscle testing, orthopedic tests, rehabilitative techniques, etc. Some of us, just take CEU, courses for those. We should think twice before we ruffle our feathers and point out these “dry needle” proponents, and see what good they are doing, like actually bringing us patients. As a cancer survivor you may be experiencing hot flashes because of surgical removal of ovaries or because of hormone suppressive therapy to decrease the levels of estrogen in the body. This problem is not just experienced by breast and ovarian cancer survivors, but it’s also a problem for men taking hormone-blocking therapy as a treatment for prostate cancer. For clothing and bed linens, use loosely woven cotton materials. Keep air circulating with a fan or an open window. Enjoy cool drinks instead of hot beverages. Avoid the things that make your body temperature increase, such as smoking, drinking alcohol and caffeine, and eating spicy foods. Be aware that certain foods that may trigger hot flashes, including those that contain tyramine such as aged cheeses, red wine, tomatoes and citrus fruits. Some of the common therapies include vitamin E, anticonvulsants, blood pressure-lowering medications and antidepressant medications. Complementary and alternative therapies include acupuncture, yoga, meditation and herbal supplements. Breast Cancer.org also recommends acupuncture. 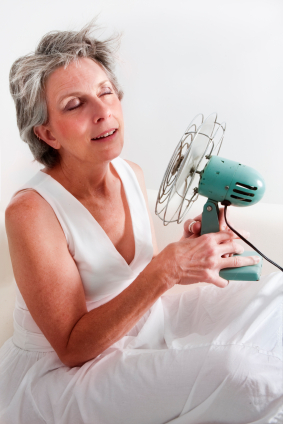 It is also important to avoid triggers of Hot flashes. Stress (hard to avoid when undergoing breast cancer treatment) is a leading trigger—underscoring the value of relaxation and stress-reduction techniques such as massage, breathing exercises, meditation, yoga or biofeedback. Other frequent triggers include consumption of alcohol, caffeine, hot and/or spicy food, and smoking.